UPDATE: Made a mistake, this is NOT free shipping. You can get Free store pickup at Macy's or Free Shipping With a $49 Order. 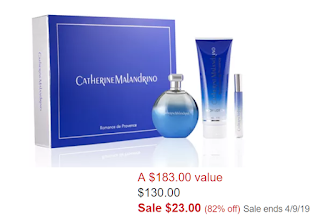 3 Piece Catherine Malandrino Romance de Provence Perfume Set $23 (Reg $130) + Free Shipping. Includes a Full Size 3.4oz Eau de Parfum Bottle which sells for $110 on it's own. Here you get it with Body Lotion and Purse Spray For only $23. Crazy Good Deal and would make a great gift!